recently released Magic Quadrant for Email Security Boundaries (published September 11, 2008), Gartner Inc., an information technology research and advisory company, placed Google in the "Leaders Quadrant." Quadrant leaders, as Gartner defines them, are "performing well today, have a clear vision of market direction, and are actively building competencies to sustain their leadership position in the market." Quadrant leaders also "offer a comprehensive and proficient range of email security functionality, and show evidence of superior vision and execution for current and anticipated customer requirements. Leaders typically have relatively high market share and/or strong revenue growth, own a good portion of their threat or content-filtering capabilities, and demonstrate positive customer feedback for anti-spam efficacy, and related service and support." The report goes on to say that "The email security market is rapidly maturing, yet continues to show strong growth and remains a 'must have' security purchase." We're pleased to be included in this report and recognized in the leaders quadrant, as it underlines, in our opinion, the importance we attach to protecting against email-based threats and the ways we're helping our customers do so. Since the integration of the Postini email security product line in 2007 into Google's Enterprise Apps, Google has continued to innovate these products with functionality for our customers, including a new early detection quarantine that uses our own heuristics to detect new virus strains before virus signatures are available. We have also added new content filter types, policy prioritization for messages that trigger more than one policy, and new policy engine interface features. The Gartner Magic Quadrant is copyrighted 2008 by Gartner, Inc., and is reused with permission. The Magic Quadrant is a graphical representation of a marketplace at and for a specific time period. It depicts Gartner’s analysis of how certain vendors measure against criteria for that marketplace, as defined by Gartner. Gartner does not endorse any vendor, product or service depicted in the Magic Quadrant, and does not advise technology users to select only those vendors placed in the "Leaders" quadrant. The Magic Quadrant is intended solely as a research tool, and is not meant to be a specific guide to action. Gartner disclaims all warranties, express or implied, with respect to this research, including any warranties of merchantability or fitness for a particular purpose. In their recently released Magic Quadrant for Email Security Boundaries (published September 11, 2008), Gartner Inc., an information technology research and advisory company, placed Google in the "Leaders Quadrant." Quadrant leaders, as Gartner defines them, are "performing well today, have a clear vision of market direction, and are actively building competencies to sustain their leadership position in the market." Quadrant leaders also "offer a comprehensive and proficient range of email security functionality, and show evidence of superior vision and execution for current and anticipated customer requirements. signatures, vacation responders, "send mail as" aliases, interface language, email forwarding, POP, IMAP, and more. For all the details, check out the Google Email Settings API documentation. When small businesses use Google Apps, it's easy for administrators to help employees configure user settings account-by-account. But this approach doesn't scale up very well for larger companies. Now that we have a growing list of customers with hundreds and even thousands of employees apiece, offering a streamlined way for admins to configure account settings is essential. Today, with the release of the Google Email Settings API, Premier and Education Edition administrators can programmatically update Gmail settings for their users in bulk by making requests to a GData feed. Modifiable settings include labels, filters, signatures, vacation responders, "send mail as" aliases, interface language, email forwarding, POP, IMAP, and more. , I don't need to think because I can search all of these sources from a single search box. You may have used Google Desktop Enterprise Edition to add desktop and email results to your Google Search Appliance search. We have also announced a OneBox for your external website and the Google Sites Integration to include your domain's Google Sites. But what about Google Docs? Now you can search all of your domain's published Google Documents, Spreadsheets, and Presentations with your Google Search Appliance. This marks the second graduation of an Enterprise Labs experiment. Advanced Search Reporting graduated with the most recent search appliance release. Today Google Sites Integration graduates from Enterprise Labs and gets upgraded to include Google Docs - both of which are included in the most recent search appliance release! Try the new Google Apps Integration. And if you want to view your Google Docs search results on a mobile device, check out this Google Docs blog post. A few weeks ago, a colleague of mine did something amazing: he displayed a Google Docs presentation on his iPhone! Afterwards, I wanted to find out more information: How can I view a Google Docs presentation on my iPhone? What other mobile devices does Google Docs support? I thought about searching Google Sites or Google's external website. I also thought about searching my desktop, my email, and the hundreds of thousands of Google Docs that Googlers have shared with each other. But luckily, thanks to Google Enterprise's Universal Search technology, I don't need to think because I can search all of these sources from a single search box. You may have used Google Desktop Enterprise Edition to add desktop and email results to your Google Search Appliance search. We have also announced a OneBox for your external website and the Google Sites Integration to include your domain's Google Sites. But what about Google Docs? Now you can search all of your domain's published Google Documents, Spreadsheets, and Presentations with your Google Search Appliance. The Google Bus goes "App to School"
a milestone of 1 million active users on Google Apps for Education and our plans for the first-ever "App to School" cross-country road trip. Today, we hit the road in the Google Bus to visit 10 universities across the U.S.
To kick the trip off, we're announcing we've reached 2 million active users, and 17 new customers to add to the thousands of universities already on Google Apps. To make it really interesting, we also made Video for Google Apps available for educational institutions. For the entire month of September, the bio-diesel fueled bus (see photo) will be visiting campuses to give students, professors and faculty a chance to play with our latest technology, talk with Google product experts and share how they're using Google Apps with our team. We will post some of our stories from the road, so be sure to follow us across the country and visit us on our new student blog. In July, we announced a milestone of 1 million active users on Google Apps for Education and our plans for the first-ever "App to School" cross-country road trip. 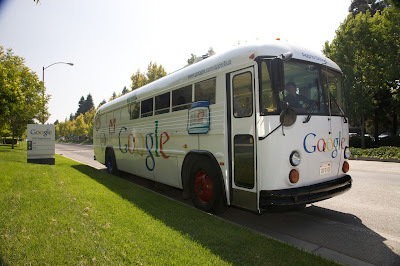 Today, we hit the road in the Google Bus to visit 10 universities across the U.S.
Google Apps has grown in numbers of users and diversity of products. We're encouraged by the stories you've sent us on how you're using Google Apps to change the way you do business, save money for your company and improve service to your internal customers. We're often asked to share ideas on how customers can use Google Apps to do things that they couldn't do before and so, we're kicking off a webinar series focused on Google Explorers such as yourself. We'll shine the spotlight on IT evangelists, business owners and productivity gurus who have employed the suite of Google Apps - (which includes Sites, Video, Docs, Spreadsheets, Calendar, Gmail and Start Page) - to more broadly share information, organize projects and collaborate and communicate more effectively. We'll also cover other topics from time to time, which we hope you'll find informative, such as demonstrating new functionality, hearing from industry experts and sharing tips on best practices. Run your business on Internet time! Lily Sarafan, COO of Home Care Assistance, discusses how her company has used Google Apps to grow nationally in a few short years on Thursday, September 18, 10AM PDT. Learn how Google Apps and AdWords have helped boost profitability at this national staffing franchisor. Register here. Use Google Apps to achieve rapid time-to-market. Three internal teams at Google delve into how they used Sites and other Google Apps to rapidly launch a new product on Tuesday, September 16, 11AM PDT. Find out how Google product teams are able to release early and often. Register here. Introducing Google Video for business. Get a demo of Google Video, the latest addition to Google Apps Premier Edition, on Tuesday, September 9, 11AM PDT. Google Video provides secure, private video sharing for organizations. Learn how other organizations are using Google Video and get your privacy, security and deployment questions answered. Register here. If you can't make it for the live presentation, you can find recordings of them on our Google Apps channel on Youtube. Also be sure to check out our Google Calendar gadget where we'll announce new webinars and other Google events. And, always let us know if there are topics you'd like to see us cover. Thanks! Thanks to you, Google Apps has grown in numbers of users and diversity of products. We're encouraged by the stories you've sent us on how you're using Google Apps to change the way you do business, save money for your company and improve service to your internal customers. We're often asked to share ideas on how customers can use Google Apps to do things that they couldn't do before and so, we're kicking off a webinar series focused on Google Explorers such as yourself. We'll shine the spotlight on IT evangelists, business owners and productivity gurus who have employed the suite of Google Apps - (which includes Sites, Video, Docs, Spreadsheets, Calendar, Gmail and Start Page) - to more broadly share information, organize projects and collaborate and communicate more effectively. We'll also cover other topics from time to time, which we hope you'll find informative, such as demonstrating new functionality, hearing from industry experts and sharing tips on best practices. , the latest addition to the Google Apps collaboration suite for Premier Edition customers. Now you can share videos securely and affordably within your organization. There's no need to deploy new hardware or software: your videos are securely stored, processed and managed in Google's powerful, distributed cloud computing infrastructure. Video for business enables your users to upload and share videos with a few easy steps. Once your videos are uploaded, using them across Google Apps is a breeze. You can share your videos with the entire domain, or with specific users. Video sharing is not just about distributing official corporate videos to the whole organization. It's also about enabling your employees to use video easily as an effective medium for communication and collaboration. Create engaging training portals or team spaces using Google Sites with video embeds, or bring a complex financial spreadsheet to life with a video highlighting the key achievements for the quarter. As an admin, you have owner-level access to all the videos in your domain, which means you can monitor your domain for inappropriate content and remove videos where necessary. Admins can also track how much video storage the domain has used, and who the top uploaders are. Video is another example of how cloud computing enables entire new ways of communication and collaboration. We believe that Video for business will transform the way you and your organization use video the same way that YouTube has transformed the consumer video space. You can learn more about video sharing and other innovative collaboration apps for businesses at www.google.com/apps/collaboration. People have been discussing the promise of corporate video for years. But to date it hasn't met expectations. Doing it well meant investing tens if not hundreds of thousands of dollars in specialized video hardware and software that are difficult to set up, maintain and use. It was out of reach to all but the largest companies, and even for them, justifying the ROI of an enterprise video deployment was a challenge. Thanks to cloud computing these barriers are now surmountable. Today we're announcing Google Video for business, the latest addition to the Google Apps collaboration suite for Premier Edition customers. Now you can share videos securely and affordably within your organization. There's no need to deploy new hardware or software: your videos are securely stored, processed and managed in Google's powerful, distributed cloud computing infrastructure.